Are you out all day and need someone to walk your dog? Or does your pet need feeding whilst you are away for the day or on holiday? 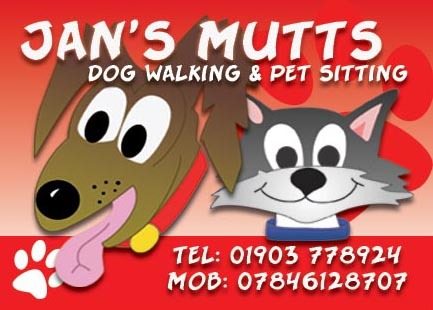 We are a friendly, reliable and experienced dog walking/pet feeding service operating in the Littlehampton and surrounding area. We provide a regular weekday service, with special negotiated rates for weekends and Bank holidays. The area that we cover is shown in the map below. Any requests to visit, or walk pets outside of this area will have a small additional charge, to cover additional travel expenses. Dog walks will last at least one hour, in a totally safe traffic free environment, and your pet will be transported in our custom made van “The Muttmobile”. The vehicle is spacious, well equipped and completely safe, providing a pleasant environment for your pet to travel in. We encourage dogs to socialise but we can provide an individual service if required. Your pet will be kept on a lead at all times unless specified. Prior to walking your dog, we would carry out a personal home visit to allow your pet to familiarise themselves with us and develop a relationship. Our pet sitting service, available for any animal, provides home visits for when you are away for the day or on holiday. Each visit lasts a minimum of 20 minutes up to twice a day, during which time we will feed your pet and give it our full attention. We are able to board individual dogs by prior arrangement.